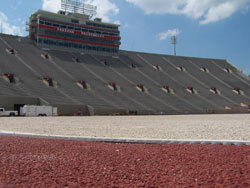 As Drum Corps International corps continue their summer tours across the nation, their sights are firmly set on Bloomington's Memorial Stadium on the campus of Indiana University. As part of ongoing repairs to the field, in the past few days the new earthen base for the field has been groomed and smoothed, ready for the reconstruction to move into its final stage, the unrolling of a new artificial turf carpet. Heavy rains in June caused damage to the gravel foundation of the field. Indiana University (IU) officials immediately moved into action, beginning repairs on the site immediately with the full intention to host the DCI World Championship events scheduled for August 7 through 9. A visit to the site by Drum Corps International executive director and CEO Dan Acheson confirmed that IU has been taking excellent care to resolve the issues at hand. Acheson said, "As reported earlier, all systems are go. 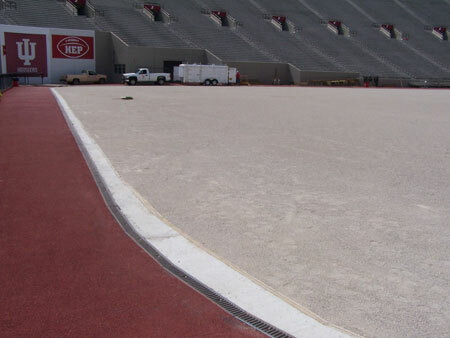 Indiana University officials have told me that all of the new drainage at Memorial Stadium is in place and the base layer is all set in order to begin installing the turf which is supposed to arrive early this week. They've expressed that the project will be completed in plenty of time prior to the arrival of our World Championships." With a new smoothed earth base, all that remains is to install the turf. Acheson said, "We remain confident that the championship events in Bloomington will be nothing short of spectacular, and we truly appreciate the work Indiana University has put in to make our event happen. If you haven't bought your tickets yet, I can tell you with confidence: Bloomington is the place to be." Order your tickets for the '08 World Championships in Bloomington, Ind.